Today we're going to move from something ressembling a wide wooden shoe to something more duck-like. As before, click on any gridded photo for a larger version. Pass the two slipped stitches over the knitted stitch. The line of the center of the decreases should be pretty clear to follow, but feel free to move up the stitch marker if you find it helpful. I like working wings/legs/etc in an afterthought style, because it means that the appendage is firmly attached to the body, no grafting or seaming needed. Meaning it stands up all the stronger to any grabby hands. Put down your working yarn, but do not cut. Knit the correct number of stitches in scrap yarn. Slip sts in scrap yarn back to left hand needle. Knit the stitches again with working yarn and carry on as usual. I like to keep the tails of the scrap yarn on the outside of the body, as this helps when you need to pick it out. Using a spare needle, pick up the right side of each stitch just below the scrap yarn stitching, picking up one stitch for each scrap yarn stitch. Repeat for the row of stitches just above the scrap yarn. Using a spare knitting or tapestry needle, pick out the scrap yarn. You should be left with the same number of stitches on each needle. The first few rounds after you pick up will be fiddly, because there's not a lot of give because the body is already stuffed. It's a bit easier if you use magic loop and isn't a problem after those first few rows. Make the facial features before you do (or at least graft shut) the beak, as it will be easier to hide the ends. Secure thread at inside of head. Bring up needle through fabric at desired position. With needle pointing away from fabric, wrap thread around shank of needle 2-3 times. (The more wraps, the bigger the finished knot). Holding onto the yarn tail until it becomes too short, push the needle down through the fabric one half-stitch over from where it came up. Pull snugly against fabric. Repeat steps 2-4 for second eye. You can also add eyebrows, eyelashes, etc. at this point. Cut the yarn, leaving a long tail and thread a tapestry needle. Place all stitches on two needles, with an equal amount on each needle and the needle tips pointing right. Put tapestry needle through first stitch on front needle (closest to you) as if to knit and pull tail through, removing the stitch off the knitting needle. Put tapestry needle through next stitch on front needle as if to purl. Pull tail through, but DO NOT remove stitch from knitting needle. Put tapestry needle through first stitch on back needle (farthest from you) as if to purl and pull tail through, removing the stitch off the knitting needle. Put tapestry needle through next stitch on back needle as if to knit. Pull tail through, but DO NOT remove stitch from knitting needle. Repeat Steps 3-6 until all stitches have been grated together. Adjust tightness of tail so join is smooth before weaving in ends. Congratulations! You now have all the techniques you need to finish your duck!! If you're on Instagram, please tag me @mscleaver or via #domenicKAL or post in the Ravelry Group by April 21st to be eligible to win prizes! 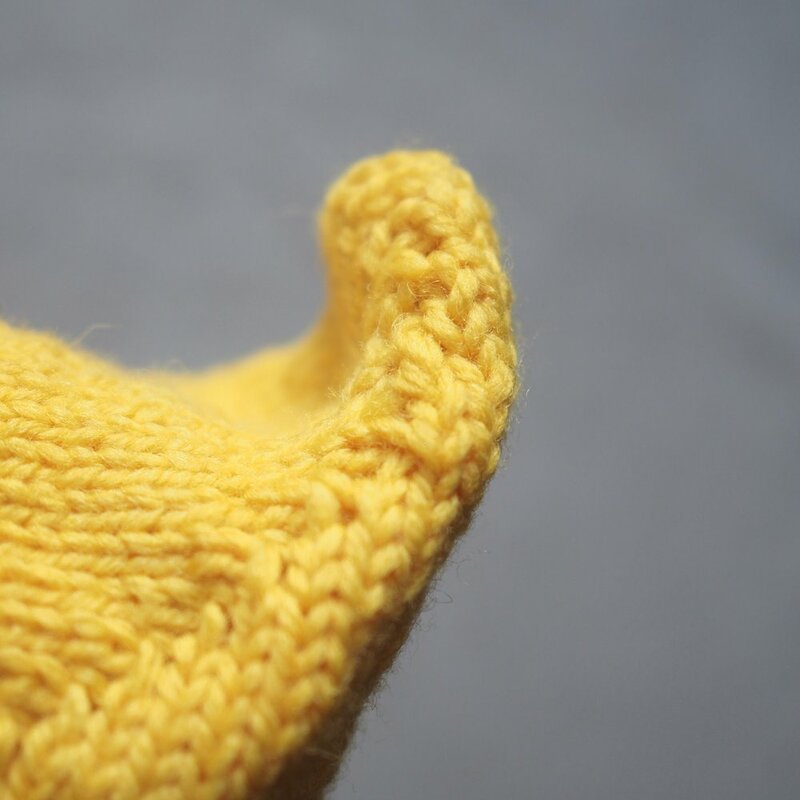 Short rows are one of the most valuable shaping tools in a knitter's toolbox. With them you can turn heels, add bust darts, raise the back neck of a sweater, and make an adorably curly duck tail. There are numerous ways to do short rows, but I'm sticking with the basic wrap and turn (W&T) version here. Knit number of stitches as indicated in pattern before wrap. To Wrap, slide next unknitted stitch to right hand needle, bring yarn to front, as if to purl. Slip st from right hand needle back to left hand needle, keeping yarn at front of work. Pull yarn to back of work. The first stitch on the left hand needle should now have a nice wrap around it. Turn work to opposite side, with yarn as to purl. Purl number of stitches as indicated in pattern before wrap. To Wrap, slide next unworked stitch to right hand needle, bring yarn to back, as if to knit. Slip st from right hand needle back to left hand needle, keeping yarn at back of work. Pull yarn to front of work. The first stitch on the left hand needle should now have a nice wrap around it. Turn work to opposite side, with yarn as to knit. As you work the short rows across the tail, you'll start to form a triangle shape at one end, with a neat little wrap around each stitch. To give the tail it's adorable curl, the outside is going to need to be longer the the inner part of the curl. So you'll need to work a few short rows where the row stays the same length/doesn't get shorter. In this case, you will be re-wrapping a stitch you've already wrapped once. Depending of the short row, you may have one, two, or three wraps to pick up as you work your way back out to longer rows. Knit to first wrapped stitch. Using the right hand needle, pick up all wraps and slide them onto the left hand needle, making sure not to drop the original stitch that was wrapped. Knit through the stitch with all its wraps. This may be a k2tog, k3tog, or k4tog, depending on the number of wraps. Purl to first wrapped stitch. Purl through the stitch with all its wraps. This may be a p2tog, p3tog, or p4tog, depending on the number of wraps. As you work the short rows back out, you'll close off the top of the triangle and have and cute little tail! Your project will also look like a shoe for a wide-footed gnome. Up next: shaping the neck and setting up for afterthought appendages. For a long time, I've been wanting to expand my designs beyond just knitting patterns, so I'm pleased to introduce my first trio of embroidery designs! Each design can be purchased as a PDF pattern or as a complete kit with pre-printed fabric, needle, thread and hoop. I've always found embroidery quite soothing, and when the design is already on the fabric, its even easier to incorporate a little slow stitching into your day. In addition to the embroidery designs, I'm also pleased to offer my Domenic Duck pattern as kits. 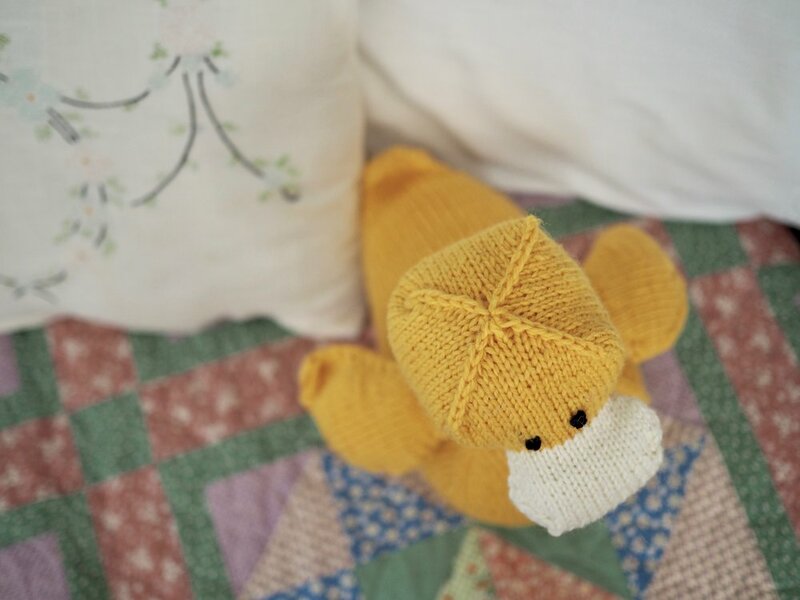 This oldie but a goody has been slightly revamped for even more adorable shaping and is the perfect size for snuggling. It's also quick enough to work up for inclusion in this year's Easter baskets. One of the comments I hear most frequently in relation to my designs is some variation of "That's beautiful, but I'm not there yet." I never want anyone to feel like my designs are out of reach, and I feel like I gain so much when I try to stretch my own skills, so I've been working to make my designs more accessible for crafters of all skill levels. This means that my new stuffed animal kits will be paired with a step-by-step online tutorial series/KAL (with prizes!) and all embroidery kits come with a basic stitch guide. Hopefully these tools will give you the confidence to take the leap and try something new!